Chubby Puppies are stumbling, fumbling, tumbling cuteness you’ll fall in love for! This adorable Chubby Golden Retriever loves to take his time getting places but has tons of fun doing it! Each rollie pollie Chubby Puppy is unique and waddles and hops in its own adorable way. Customize their legs for even funnier walks and hops! These fumbling, tumbling puppies love to run after their toys with their tongues and ears flapping as they bob up and down. 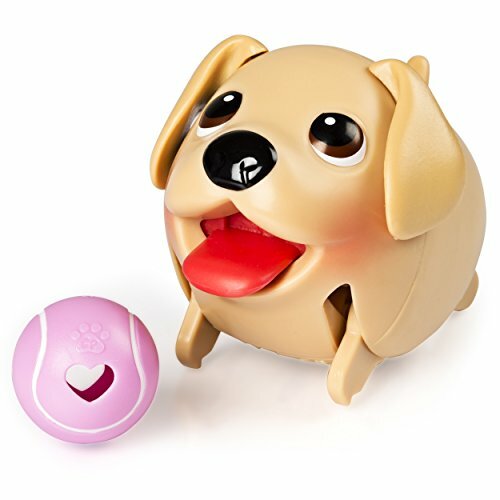 The Golden Retriever comes with a special pink tennis ball toy that he can play with and chase after in a humorous way. It’s a cuteness overload! Collect the Collie, Shih Tzu, Bulldog and Pug for a true Chubby Puppies waddle party! Bring home the undeniable cuteness of Chubby Puppies and adopt your Golden Retriever for playtime today! Chubby Puppies are the stumbling, fumbling, tumbling puppies you'll fall for! The Golden Retriever comes with a special pink tennis ball toy that he can play with and chase after in a humorous way. Collect the Collie, Shih Tzu, Bulldog and Pug for a true Chubby Puppies waddle party! If you have any questions about this product by Chubby Puppies, contact us by completing and submitting the form below. If you are looking for a specif part number, please include it with your message.